Happy November! I had a breakneck schedule in October and we’re already counting down to Thanksgiving, so it’s pretty much a headlong rush to the end of the year. I AM looking forward to putting some holiday recipes and sharing my annual cookbook reviews and gift guide though – so don’t worry, they have a place on my to-do list! I’m kicking off my holiday cookbook reviews with a simple stunner: The Guittard Chocolate Cookbook , written by Amy Guittard, the great-great-granddaughter of Guittard company founder Etienne Guittard and the company’s current marketing director. What I love as a San Francisco resident is that Guittard is a local bean to bar chocolate maker. Their factory is located in Burlingame, about 20 minutes south of the city, and sometimes when you pass through the town the air literally smells of chocolate – a real-life Willy Wonka’s chocolate factory. Guittard was one of my first choices when I started taking my pastry more seriously, and I still always have a supply of Guittard baking wafers in my cupboard; the wafers melt easily and the fruity, slightly tannic chocolate flavor works well in most all my chocolate desserts, especially in brownies and cakes (this caramel crunch brownie is a favorite). Amy Guittard, apparently the baker of her family, provides a host of recipes using her family’s signature chocolates, along with plenty of personal stories and insight into the workings of a chocolate company. Most of the recipes fall under quite doable for the home baker, from cookies to brownies to pound cakes. Two of Amy’s personal favorites, pumpkin chocolate chip cookies and chocolate persimmon cake, are unusual and intriguing twists on the familiar. I settled on making a recipe with a similar complex mélange of flavors, the Roasted Banana Chocolate Tart, from the “Chef’s Chapter” at the end of the book. The chapter is billed as containing slightly more difficult recipes created by the company pastry chef, Donald Wressell. This tart honestly is not that hard though; it just has multiple components that need to be coordinated ahead of time. 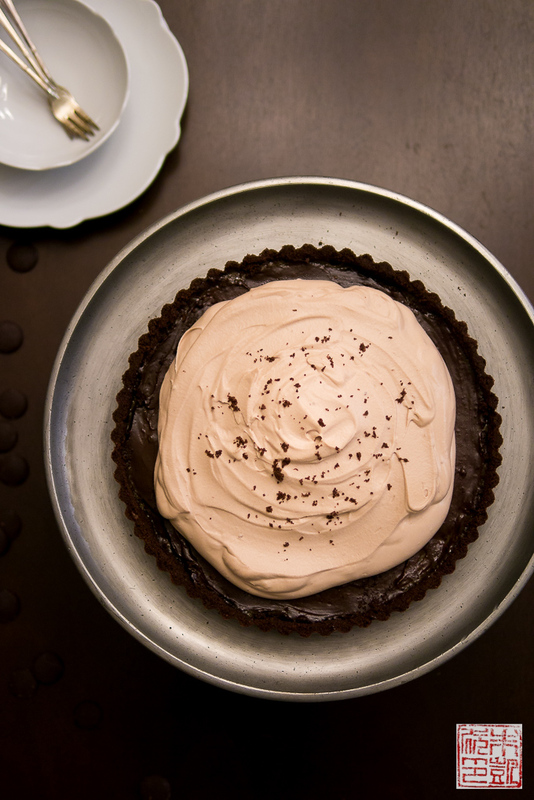 A cocoa-dark tart shell houses a vanilla bean-flecked roasted banana marmalade, with a thin layer of bittersweet chocolate ganache on top and a final topping of milk chocolate whipped cream. Note: I confess I substituted my favorite chocolate cookie crust for the tart shell in the recipe; it has a crisp crunchiness that holds up well to the rest of the tart. It’s also faster to make and cuts down on the preparation time. If you’re really looking to save time, you can use chocolate wafer cookies from the store, but try making the tart shell from scratch; it’s really fast and definitely worth it. Although the recipe calls the filling “roasted banana marmalade”, it’s simply bananas roasted with butter, vanilla, and turbinado sugar into a marvelously fragrant puree that spreads easily over the bottom of the tart shell. Definitely use your ripest bananas for this; roasting them further brings out the intensity of their flavor. My mouth was watering from the scent coming from the oven before I even started melting chocolate! A simple bittersweet chocolate ganache goes over the banana marmalade – I used Guittard’s 74% baking wafers for the chocolate. 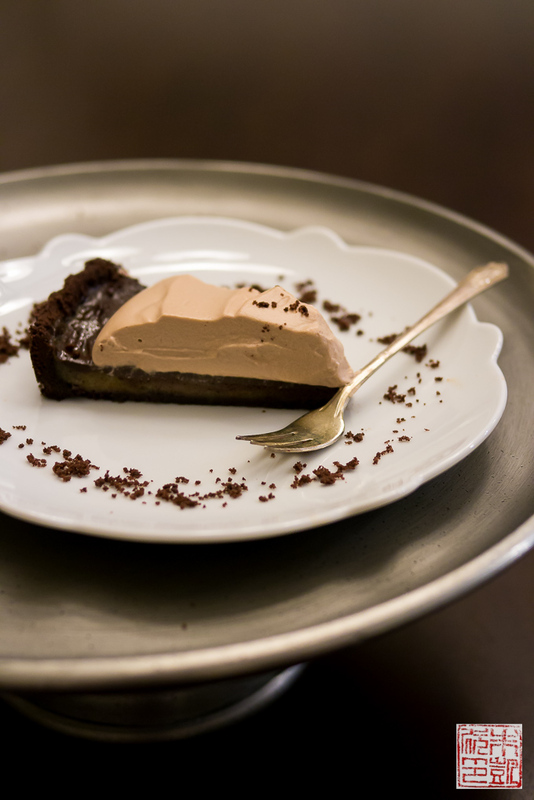 Amy mentions in the recipe notes that the ganache has an egg added, which makes it set into a denser, more velvety texture. The ganache does set to a firmness that gives the impression of something very dense and rich; I barely needed more than a thin slice to feel satiated. The only caveat is to pour the ganache over the banana filling as soon as you make it, as if you let it sit around for too long it will start setting and become trickier to spread. Just make sure you have the tart shell with the banana filling ready to go, and pour the ganache over once you finish blending it together. 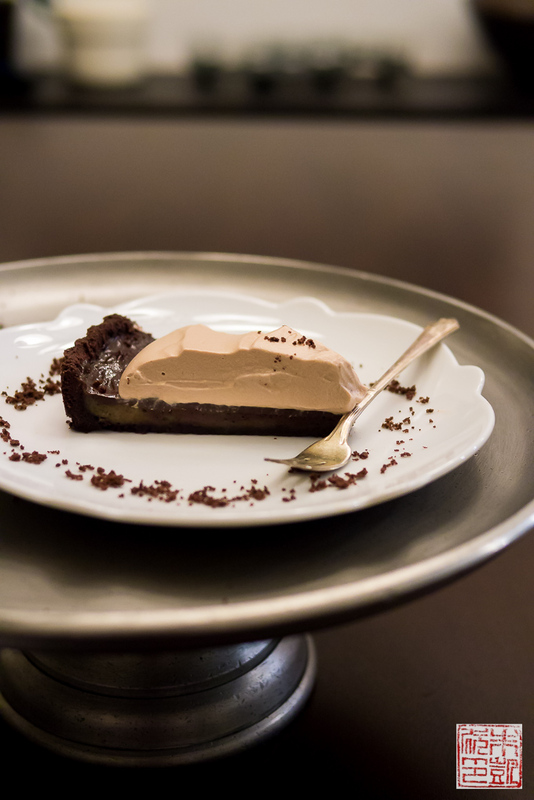 A short bake in the oven to finish setting the ganache, and all the remains is to crown the tart with a splendid dome of milk chocolate Chantilly. The chocolate Chantilly is also unusual; it uses a combination of milk chocolate, honey, and malted milk powder for depth of flavor and a touch of corn syrup for stability. The mixture whips up into a glorious billowy cloud that makes for an impressive topper to the tart. 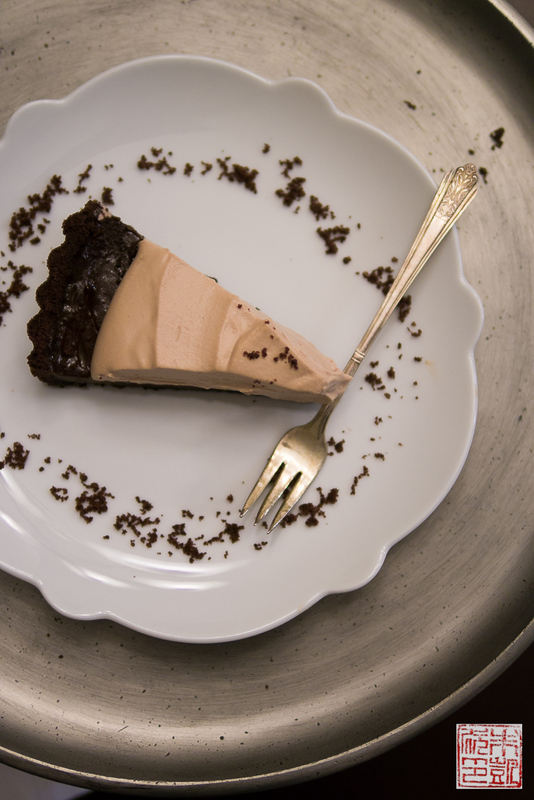 Although it looks like a lot of cream, it does provide a needed lightness to counterbalance the richness of the chocolate tart. Taken all together it’s a lovely combination of flavors and textures, and definitely a worthy showstopper for the holiday table. Thanks to Guittard for continuing to innovate and provide some beautiful chocolate for professionals and home bakers alike, and also especially to Amy for sharing some of her family company’s history in this cookbook. 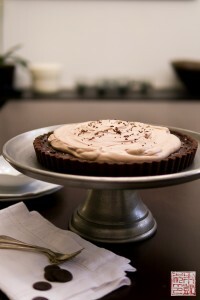 I’m looking forward to a holiday season full of fabulous chocolate desserts! Adapted from the Guittard Chocolate Cookbook. Cookie crust based on recipe from Serious Eats. Place the milk chocolate in a large heatproof bowl. Set aside. In a medium saucepan, combine 1 cup (240 ml) of the cream, the corn syrup, honey, and malted milk powder and bring to a boil, stirring frequently. Pour the hot cream mixture over the milk chocolate, and let sit for 5 minutes. Then whisk the chocolate mixture until smooth. Add the remaining ½ cup (120 ml) cream and whisk until just combined. Place plastic wrap directly on the surface of the chocolate mixture and refrigerate for at least 30 minutes, or up to overnight. Preheat oven to 350 degrees F. Line a baking sheet with a Silpat or with foil. Set aside an 9 inch fluted tart pan with a removable bottom. Combine butter and sugar in bowl of stand mixer. Cream for about 3 minutes until light and fluffy. Combine the flour, cocoa powder, and salt in a medium bowl. Add to stand mixer and beat until combined. Mixture will be loose and crumbly. Pour out mixture on prepared baking sheet and spread evenly. Bake for about 20 minutes, rotating halfway. The cookie crumbles will start smelling very fragrant. Place cookies into food processor and pulverize into even, fine crumbs. Pour out crumbs into a medium bowl and add the melted butter. Stir with a spoon to combine. Press crumb mixture evenly into bottom and up sides of tart pan. You will probably not need all of the crumb mixture. Bake tart shell for about 10 minutes in the 350 degree F oven. Remove and let cool before filling. Raise the oven temperature to 400°F. Peel and cut the bananas into chunks and place the banana pieces and butter in an 8” x 11” baking dish. Put the vanilla bean seeds and pod, orange juice, and raw sugar in the baking dish. Roast in the oven for 20 minutes, stirring as needed. Remove the baking dish from the oven and let cool for 30 minutes. Remove the vanilla bean pod from the mixture and discard. Pour the rest of the mixture into the bowl of a food processor (or blender) and pulse until smooth, about 1 minute. Set aside. Place the bittersweet chocolate wafers in a medium heatproof bowl. Set aside. In a medium saucepan, bring the milk and cream to a boil. Pour the milk mixture over the chocolate and let sit for 5 minutes, then whisk until the chocolate mixture is smooth. Pour the chocolate mixture, butter, and egg into a blender and blend until smooth. Use immediately before it sets. Preheat the oven to 200°F. Pour the banana marmalade into the cooled tart shell, spreading it to the edges. Top with the chocolate filling, also spreading it to the edges. Bake for 20 to 30 minutes, or until the top is set. Let cool at room temperature for about 1 hour. Remove the chantilly from the refrigerator and beat in a stand mixer fitted with the whisk attachment (or in the bowl in which it was refrigerated, using a hand mixer fitted with the whisk beaters) on low speed until light and airy, about 3 minutes. Spread or pipe the chantilly on the top of the tart. Serve this the same day you make it, because the fillings will make the crust soggy if it sits for longer than 1 day. Store in the refrigerator in a covered cake carrier or wrapped with plastic wrap. Had never heard of Guittard but love that the focus is to turn a local bean to bar chocolate. Love supporting those kinds of businesses. This sounds delicioussss! this tart sounds and looks delicious. I have got to make it really soon! So many fabulous components in every bite. What a marvelous tart! Gorgeous flavors here. And I love the idea of a Roasted Banana Marmalade. I could see myself spreading that on toast or a muffin or a scone. YUM! Beautiful! This sounds so rich and delicious, love that roasted banana marmalade! A real-life Willy Wonka factory. Swoon. That tart is amazingly delicious and elegant. What a positively stunning dessert! Blown away by the flavors. OMG. I love your photos!